Can you imagine your children wanting to keep their hands clean all the time? Even being excited to spend time washing them? It is possible! 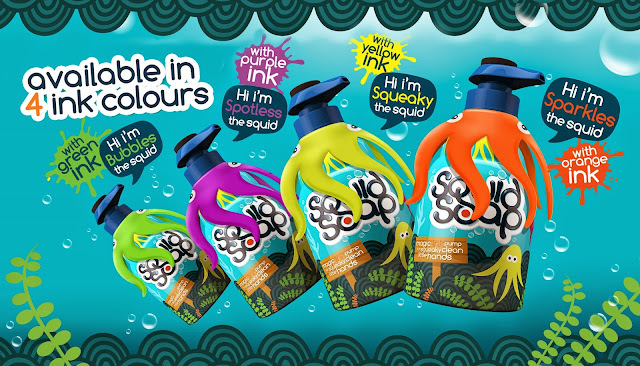 Squid Soap, is an innovative, gentle children’s soap, which teaches your child to wash their hands properly, in a fun and exciting way. 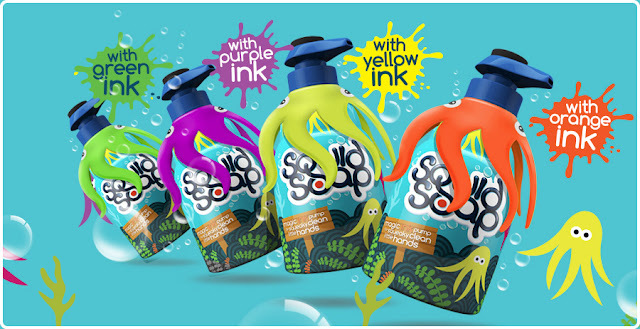 Simply by pushing down on the dispenser, a washable stamp is stamped on their hand, using the creamy lather children can wash the stamp off, and their hands are clean, the bright fun bottle appeals to all ages, and it even comes with a collectable squid bath toy. With 4 fun colours to collect, orange, green, yellow and purple, children will love to collect them all. Clean hands are essential for hygiene, and Squid Soap will teach your teach your children a lifetime of correct, healthy hand-washing skills. The fun of bright bath toys, and the magic of seeing the different colour stamps disappear from their hands is a fantastic treat for small people; and parents will love the fact that their little ones are washing their hands properly, without supervision. 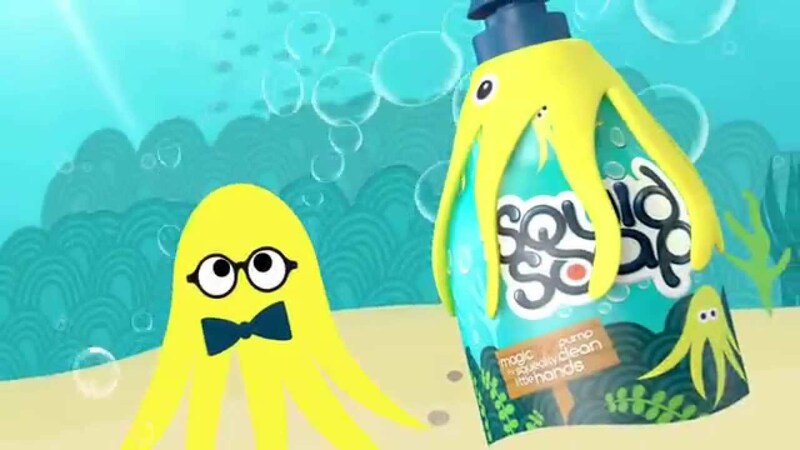 As with all children’s products, safety is paramount, and, as fun as Squid Soap is for your children, parents can be safe in the knowledge that the gentle soap is kind to their skin, and even the washable stamp is gentle and completely removable. Correct routines mean happier and healthier children, and we all know how quickly germs spread from hands. Squid Soap is an interactive way to let your children have fun and get their hands dirty, with parents safe in the knowledge they with take pride and have fun getting clean afterwards, a completely unique product which makes every day handwashing more fun for kids. We have been using Squid Soap for a while now and it's certainly made hand washing fun for Noah! He loves to use the pump himself and the little collectable squid really makes him giggle. His favourite thing to do at the moment is to hide it in my shoe, which gives me a little surprise when I feel something squidgy in there! Haha! How would you like to win a months supply of Squid Soap? To win 2 bottles of Squid Soap all you need to do it use the Rafflecopter form below. Good luck and don't forget to check out my other competitions. My twins have a tea set each I bought from poundland. They spend ages pretending to pour cups of tea. My girls play with a plastic teaset in the bath - they make mee bubbly lattes! My little boy likes to play with them all, no favourite as yet. My boys both love taking lego men and boats into the bath! The kids don't really do bath toys anymore. Luckily they still like soap/shampoo in cute or quirky packaging. My sons love to play with the measuring jug we use to rinse their hair, simple things! A little boat that has a bubble machine inside! They have imaginext toys in the bath. They LOVE bath time. Yes, my son loves his foam letters. Empty bottles are all they needs, squirting them at each other keeps them happy for ages! BattleKid loves putting his nuby bath letters and numbers into his munchkin jug and pouring them back into the water! Crazy boy! No, just lots of bubbles! My little one has 3 boats that clip together with magnets and my older one wears his snorkel and mask in the tub. both my girls enjoy playing with the bath tea set they have got. A Vtech musical boat..with a bear at the moment! She likes playing with the cups used to rinse her hair. my son has an elephant water can he calls Nellie, he adores that. My daughter likes her purple duck. Stripy - his robot fish! Out of all the bath toys we have brought it always comes down to one favourite.... the sponge!!! Yes, an old tatty duck with only one leg. My daughter loves her bath crayons. Old fashioned in our house a jug! A bubble machine on the side of the bath. The matey bottles become instant bath toys! My son loves his munchkin submarine. Squirts soap!! It makes great cream for a pretend hot chocolate!!! My children love their Octopus, they love throwing the rings in it's tentacles. My son loves to play with his wash mit! He thinks it is a hand puppet. It's an orange plastic colander and the twins pour "rain" over one another! We have an ancient cat shaped bottle that has to go into the bath and get used by twins to soak each other! just a collection of old bottles keeps her very happy. Bottles and buckets keep them happy in the bath! My two love playing with empty bubble bath and shampoo bottles in the bath! We just have empty bottles & foam soap. They love them both! Our bath crayons are a firm favourite! Empty bubble bath bottles are my sons favourite! Stacking cups are endless fun in our house. Mine love the tea set and making me cups of tea with loads of foam on top. A big dipper wheel that is stuck on the side of the bath, so he can pour water into. My granddaughter loves A large pink rubber jug which she continuously tips water over her head with. we have a twirlywoos big red boat bath toy. theyre obsessed with the show so they both love it! My son loves a minging smelly crocodile toy more than anything. A Playmobil Noah's Ark - and all the animals! A set of cups to pour water everywhere! My grandchildren like squeezy toys which spray water around. The lids off all the shampoo bottles! My little girl loves her two mermaid dolls that I gave her that were mine when I was little, their tails change colour in the water. I receive requests for things that hold water like plastic mugs, small bowls and measuring cups. My young kids love to play with a rather cheap plastic mermaid with purple hair. The arms have fallen off, it has only a few strands of hair left but it still remains the favourite as they like to wash the hair! Bubble bath too is a great one but the wife always tells me off as I put too much in and the 2 thirds of bubbles just makes a mess :) Happy days. My daughter is obsessed with the Octonauts at the moment and she loves playing with the Gups in the bath! My son adores his boats and has several that he likes to play with in the bath. He likes to make big waves for them to sail on which often leaves me with a wet floor! A little sailing boat and some empty shampoo bottles are their favourite things. My little boy loves his pirate boat, it even has a cannon that squirts water. anything that makes a good splash!! My granddaughter loves her water wheel which suctions onto the side of the bath, pouring water in the top, the wheels and cogs turn round and then the water gushes out of the bottom which she tries to catch, a toy that keeps her really happy for ages. My daughter has light up rubber ducks and my son loves his water pistols!